(Newser) – Until now, scientists have measured ice thickness using satellite images, visual estimates, and by drilling holes in the ice itself. But in Antarctica, much of the floating ice is actually underwater, with ice so thick that drilling and satellite images just don't work. 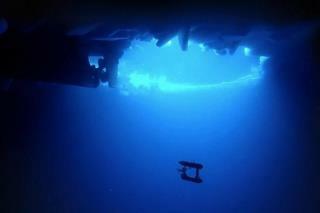 For the past four years, a team of researchers from the US, UK, and Australia have been deploying an autonomous underwater vehicle they call SeaBED to explore areas that divers and other machinery can't reach and, using sonar, measure the ice's thickness from the bottom looking up, reports UPI. They're now reporting in the journal Nature Geoscience that, while a lot of ice remains to be measured, they've been surprised to find ice as thick as 65 feet. Global Cooling is a major problem. We need to put more CO2 in the air to help warm things up. At this rate of icepack growth we will have to have icebreaker attachments on the cruise ships to ensure I can still cruise during the "summer". For all you people screaming about climate change I am do my part I just put more wood on the fire (CO2) (would get coal but I get my wood for free) And I just passed gas (Methane) I also am think of getting some cattle (More Methane)! I am also going to go all incandescent light bulbs! It is all Bushes fault and global warming.